Since the first waves of immigrants entered the country in the nineteenth century, scholars and the public debated the benefits, pitfalls, and importance of assimilation for immigrants in the United States. Assimilation is a process of change: a minority group changes somehow to accommodate for mainstream values. Traditional theory views assimilation as inevitable and necessary for a group to enter the mainstream (1). No cultural loss in the mainstream occurs; only the assimilating culture loses. The assimilated lose their ethnically unique culture and language while the mainstream loses very little, if anything. The Anglo-Saxon and Protestant American majority supported this assimilation theory for decades, hoping the “lesser” cultures and languages molded into the mainstream. Theorists eventually scrutinized this antiquated theory, attacking its ethnocentric nature. Assimilation theory underwent reconceptualization, starting with a shunning of assimilation altogether. Most theorists saw assimilation as a negative process that irreparably changed immigrants and their culture without changing the mainstream culture at all (1). Recent assimilation theorists claim the reconceptualized theory overlooks important benefits and side effects. Theorists reject the traditional one-sided assimilation theory, with the Anglo-Saxon tradition remaining entirely intact (1). Theories point to a strong convergence of cultures as the Anglo-Saxon tradition slowly cedes ground in the mainstream to other cultural traditions. Two theories took on opposite ends of the spectrum, one supporting cultural pluralism as the norm, while the other points to incorporation that disadvantages minority groups (1). Richard Alba and Victor Nee provided a contemporary definition of assimilation accounting for all of these factors in their book Remaking the American Mainstream: Assimilation and Contemporary Immigration. According to Alba and Nee, assimilation is a decline in ethnic distinctions and the cultural and social differences related to those ethnic distinctions. The definition allows for the possibility that the mainstream itself changes during the process of assimilation. Sometimes the change is so dramatic assimilated groups will not sense the differences separating the mainstream and their familiar social and cultural practices (1). Alba and Nee’s theory allows for incredibly diverse assimilation pathways. Current assimilation theorists support this aspect of Alba and Nee’s theory, observing many different assimilation pathways for different immigrant groups. In the south Latino(a) immigrants incorporate into the mainstream through religious organizations (4). Churches let immigrants access resources they might not normally access; this is especially helpful for undocumented immigrants. Elsewhere, spatial assimilation integrates immigrants into communities without many immigrant residents. Ideally the community eventually accepts and encourages more immigrant residents (2;7). However no pathway to assimilation works the same way for any two immigrant groups, and barriers within communities continue to block most pathways. Mainstream majority dominated communities block or entirely deny many assimilation pathways. Latina mothers find difficulties assimilating themselves and their children due to language barriers at schools (6). The majority many times perceives this phenomenon as disinterest on the part of Latina mothers, creating further tensions and barriers. The frequency of spatial assimilation remains low as well in communities reluctant to allow immigrants and other minority groups into “mainstream” neighborhoods (2;7). In both cases some theorists see an overlying problem with the earlier theories of cultural pluralism. Some postulate that greater racial and ethnic diversity will continue to deepen ethnic and racial differences rather than blur the barriers between ethnic groups (3). Debates about assimilation continue unimpeded for the most part as social scientists struggle to understand assimilation theory’s complexities. Assimilation happens: this is the consensus of the academic world. Academics largely agree that assimilation is also a necessity for immigrants to enter the American mainstream. However the advocated pathways for assimilation vary widely. The disparities stem from the movement of immigrants to new immigration destinations, areas unprepared for immigrants or specific immigrant groups, or both (3). According to academics, the assimilation models and pathways that applied to old immigrant destinations do not apply to the new destinations (1;3). On top of this, academics advocate for assimilation models that allow for the greatest native culture retention while gaining entrance into the mainstream culture (1;4;2;7). Pew Research polls show an American public with widely disparate notions of accepting immigrant groups. These views span political ideologies, although general trends exist. The hard right and the hard left in America predictably hold opposing views about immigrants. 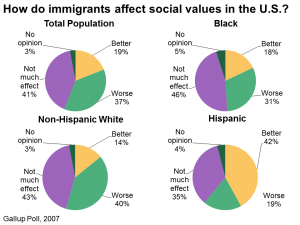 A majority of the hard right sees immigrants as a burden on American society, while the hard left views immigrants as strengthening influences on American society (5). 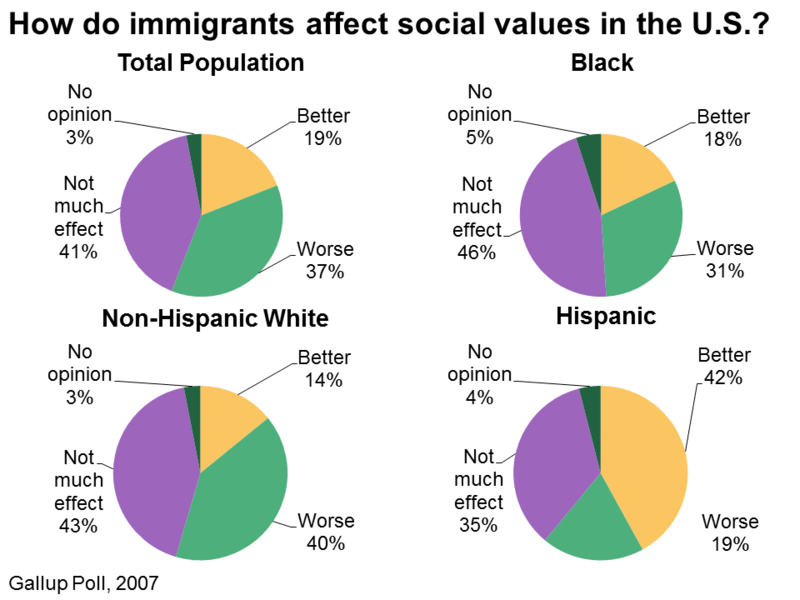 Gallup poll information from 2007 reveals most Americans believe immigrants worsen or have no effect on American social values (8). Despite American public opinion, the mainstream frequently changes to accommodate immigrant culture. The number of ethnic categories on census and employment forms increases with every form revision, showing mainstream acceptance of multiculturalism (1). 1. Alba, Richard, & Victor Nee. 2003. Remaking the American Dream: Assimilation and Contemporary Immigration. Cambridge, Massachusetts: Harvard University Press.